I went to Italy with my parents and sister this year. It was an amazing experience and I would love to go back and explore more of the country someday. We ventured all over Tuscany but we didn't make it to Sicily and our adventures were more in the line of bathroom mishaps than stumbling on a dead body but Mario Giordano's Auntie Poldi and the Sicilian Lions, the first in a series of mysteries, had me smiling and remembering our trip with great fondness. Maybe if I go back and visit Sicily, I can meet my very own Auntie Poldi. Auntie Poldi, a sixty year old Bavarian woman, has recently retired from her job as a costume designer. Despite having lived forever in Munich, she decides that she wants to be closer to her sisters-in-law in Sicily and so she finds and purchases a crumbling home there. Her plan is to drink herself to death in the warmth of the sun near the ocean but her nephew Giordano, a frustrated writer floundering with his ever changing family history novel, is dispatched to live on and off with Poldi to keep an eye on her. More than keeping an eye on his eccentric aunt though, he narrates the story of Poldi's at first accidental and then intentional involvement in a murder with all of the chaos, theories, danger, and uncomfortable situations that accompany that involvement. As Poldi is a personable and caring woman, she collects friends and acquaintances in her new home, including the handsome, young Valentino Candela, a handyman who helps out around her dilapidated house. When Valentino goes missing, Poldi is concerned, and more so when no one else seems to blink an eye at his disappearance. Then she stumbles on his body on the beach and vows to uncover his murderer. This brings her in direct opposition to the official investigator, Vito Montana, to whom Poldi has an immediate attraction despite his seeming indifference to her and his explicit warning to her to stay out of his investigation. But Poldi has some theories and she's determined to follow them up and find out the truth. Poldi is a quirky, feisty character. She is generally confident and self-assured both sexually and intellectually but she also has moments of definite faltering and self-doubt. She can be a figure of fun (constantly setting her wig straight) but there's never any doubt that she'll eventually find out what she wants to know. Her relationship with Montana is well developed and the personal and professional tension between them moves along at a good pace. The search for Valentino's murderer is as much a search for the motive as much as it is for the killer. 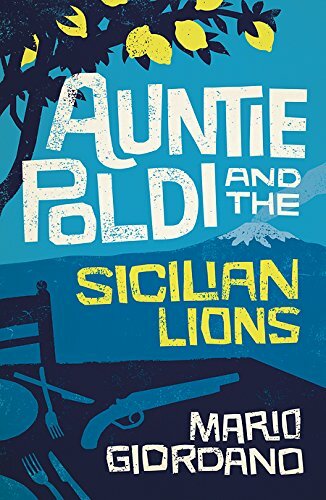 The setting was very well done; the reader could easily visualize both the beauty and the seediness of Sicily and while there were occasional info dumps about the history of the island, they were ultimately significant to the search for the murderer. Giordano, the author (as opposed to the nephew narrating the story), explains the general Sicilian character nicely without resorting to cliche and then personalizes each of his carefully created characters. The story did take some time to get moving, building Poldi's past and her family's worry for her, as well as establishing the character of the town and the people in it, but once Valentino's body appears on the beach, the story picks up, even when Poldi runs into dead ends or has to reassess her theories. There is a dry humor here and the language is perhaps a little more literary than usual so it's not a book to breeze through. But the setting is sublime, the characters are engaging, and the mystery unfolds so that the reader only comes to figure out whodunit when Poldi herself does. A promising start to a series for mystery readers who like a little flamboyance and a little foreignness in their mystery reading. Thanks to Bitter Lemon Press and Meryl Zegarek PR for sending me a copy of this book to review.